EssayMama - Essay Writing Service for your needs! Essay Mama Knows Best When It Comes To Essay Writing Service! Does an essay assignment make you feel confused? Are you staying up all night and day in search of writing inspiration? Essay Mama Knows How To Answer On "Write My Essay!" Instead of burning that essay assignment up in a fit of rage, all you have to do is hand it over to EssayMama.com. Here's how it works. Send us your assignment: Remember when you were a kid and you would come home from school and hand your mom your homework folder with all of your assignments so she could help you? Well, it's kind of like that. Just send us the details of your essay assignment and any resources or special instructions you might have. Our expert writers will get the job done: Like any good mom, EssayMama wants only the best for her loved ones. That's why we only hire essay writers who are the best in this business. Our team includes subject matter experts from every field with PhD and Master's degrees. You can rest easy knowing a true professional will be carefully crafting your essay to help you get the best possible grade. We'll deliver your paper on time: We're never late! Just tell us your deadline and we'll make sure your essay gets written and in your hands on time. That's our promise to you! Unlike other essay writing services, we take customer service very seriously. We're here to take good care of you at all times. Our 24/7 customer support team is here day and night to help you in any way we can. We are always available to answer your questions and provide you with friendly, helpful one-on-one service. Your satisfaction is always our top priority! 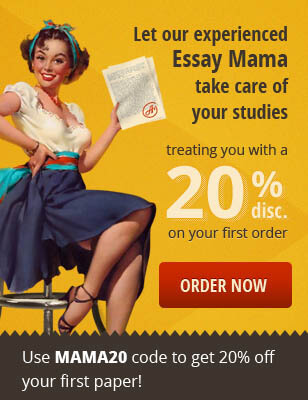 Essay Mama Helps You Save! We don't want you to spend all of your money on essays. You're a student, and you need money to eat and to have a little fun, too. That's why we offer some of the best deals on professional, custom-written essays. Our prices are very reasonable, and we offer a number of discount options to help you save even more on your order. Don't forget - our essay writing service are backed by a satisfaction guarantee, so you have nothing to lose! You can count on a great mom to help you with anything. The same goes for our agency. Our writing agency includes all types of academic writing. We can help with essay writing , research paper, thesis paper, and any other writing assignments you might have. No matter what the subject or level of difficulty, our team has you covered! It's time to stop stressing out about your essays. By providing us the complete details of the project, we can immediately assign one of our experts and have the contents delivered on or before the set deadline. Essay Mama guarantees its clients that we will live up to their expectations and criteria. Help is here. Unlike other writing service providers charging high prices that do not even provide quality and original content, we are the market changer. Not only do we create original and quality writing, we also charge competitive rates like no other. All you have to do is ask Mama for help! We will write essay for you so fast before you can eat your mother's pancakes! In finding an essay writing consultant, you can never go wrong in choosing Essay Mama for your course work. With extensive experience and diverse background in creating various projects, Essaymama.com, known to be a reliable writing firm is simply the best choice. Whether you are searching for experts who can provide essay writing help or for dissertation writing, our team of talented and skilled writers who are experts in their respective fields and subjects areas can definitely provide the content based on your criteria and other requirements. Essay Mama is home to a broad range of writing services depending on your needs. Whether it is for a coursework, for content creation online or for other use, we can surely help you come up with the best content. In creating content, you would often ask the following questions: "How do I write my essay? ", "Where to start? ", "What tools can I use? ", "My essay is due tomorrow, what to do?" Instead of finding the resources that you need in other websites, our site offers everything that you need in just one website. Apart from offering you high-quality essay writing service, our experts also share their knowledge and expertise to equip content creators and fellow writers with the current tools that are now being used for content writing and research work. Interested clients can easily get the necessary information and details that they need from our website. But apart from the info on services and contact information, we also offer our readers and clients updated and informative content, which can help them further improve their writing and develop creative and highly engaging content. Access and follow our blog. You can read various articles that you can find really useful in content creation. Essaymama's Writing Blog offers interesting insights as well as suggestions to help essay writers and online users enhance their work. For the benefit of our readers, we provide you with fresh, useful and informative content regularly. View our blog and get to know more about us and the kind of writing service that we can give to you. Contact us for your writing needs. Let us help you with your work and you will never again have to worry about submissions.